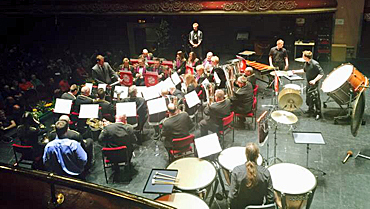 Over the weekend of the 7-8 March 2015 more than sixty bands competed in the Yorkshire Regional Brass Band Championships at St. George’s Hall, Bradford. Skelmanthorpe’s two contesting bands battled it out alongside some of the finest bands in Britain at their respective levels, endeavouring to accomplish a fine performance to match any other on the day. Prospect Brass, the first of our two bands, took to the stage on Sunday afternoon having being drawn at number 3 playing the 2nd section piece, Variations on Maccabeus by Kevin Norbury. The band were delighted to be awarded 3rd place by the 2nd section adjudicators, Simone Rebello and Kevin Wadsworth. Congratulations to Musical Director, Philip Garlick and the entire band. A recording of this performance can be heard by visiting the band’s YouTube channel. Later the same afternoon and competing in the championship section, Skelmanthorpe Band drawn at number 7 presented its performance of Peter Graham’s piece, The Torchbearer. On the day, the fruits of Skelmanthorpe’s labours were not well received and the adjudicators for the championship section, Lt. Col. Graham Jones and Nigel Boddice, placed the band 12th. This result was not the outcome the band and its MD, Martin Hall had hoped for and from January 2016 the band will face relegation to the 1st section.